While classroom animals have slowly become less and less common, rabbits are still brought up as a seemingly easy-to-take care of classroom pet. However, this could not be further than the truth. 1 Why are rabbits a poor choice? Why are rabbits a poor choice? Rabbits are easily stressed and do best in a quiet environment — few, if any, classrooms fit that description. Rabbits have small, fragile bones and can be severely injured by unintentional mishandling. Rabbits have been known to break their backs and other limbs struggling to escape from an inexperienced handler. 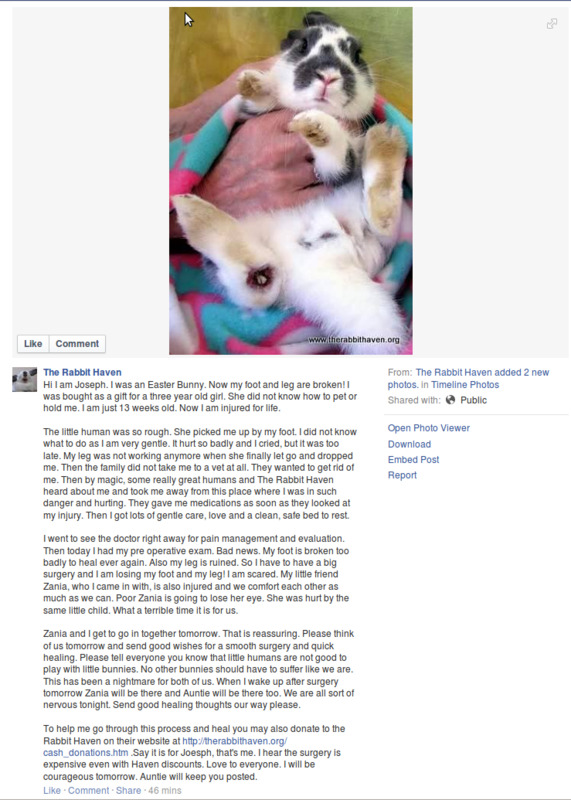 Here is an example of how an unsupervised child permanently disabled a rabbit for life. Rabbits do not normally like to be picked up. Hawks and owls are their natural enemies, so rabbits have an instinctive fear of being lifted off the ground. A frightened rabbit is likely to bite or scratch a child (or adult) who tries to pick it up. Teachers and school officials should consider their potential liability for injuries caused by the rabbit as well as their responsibility for the animal’s well being. Rabbits need to be approached slowly, quietly, and confidently. An even better approach is to allow the rabbit to approach the human for attention. Children are naturally enthusiastic and tend to approach rabbits quickly, reaching their hands into the cage suddenly or shriek loudly in excitement. Depending on the individual rabbit's personality, this will either traumatize it or cause the rabbit to "protect" its territory by lunging at (and perhaps nipping) the child. Once they realize the rabbit is more likely to hide or struggle than cuddle with them, children typically lose interest in the rabbit. Rabbits need a primary caretaker with whom they will bond because they can become frightened, lonely, and depressed if separated from their caretaker. A rabbit who is left alone in a cage in a dark classroom can literally "die of a broken heart." Classroom rabbits who rotate to different homes on weekends and over summer vacations will likely become fearful and insecure. Kathy Smith, Classroom Rabbits — Why Not? rabbitron.com, Classroom Rabbits -- What are you really teaching? Celebrating Rabbits, Marie Mead, Bunnies + Classrooms = Mismatch! This page was last edited on 9 September 2014, at 21:44.